The Three Rs: Rants, Raves and (Occasional) Reflections: Whatever Happened to Spring and Autumn? Whatever Happened to Spring and Autumn? These days, it seems we have only two seasons: summer and winter. 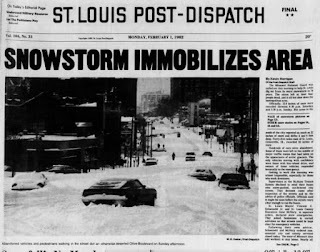 I'll never forget the snowstorm of 1982. I'd been in the hospital for eye surgery and had been released the day before--just in time to take Collin to the ER because one of our village idiots had failed to make sure the basement door was actually closed and he fell down the stairs. He had a broken collarbone. Said village idiot almost got a broken neck for her stupidity. A few days after the "blizzard," Dad had to dig our car out so Mom could go to the grocery store. After she left, he finished clearing the spot off so it would be easier for her to park when she got back. This was taken about a block from our place. He'd just gotten finished when another car approached. The woman driving was determined to park there. "I just spent an hour clearing this off for my wife," he told her. The woman was still determined to park there. She thought she could wait him out. She was in her car, her heater was on. No way could he outlast her, right? She had no idea. Dad was almost seventy, taking meds for hypertension and heart disease, but he ran on sheer stubbornness. He would have willingly frozen to death before he let her park there after all the work he did. Postscript: I just paid my annual domain registration fee, so figured I'd better post something. Maybe once a week, a "best of" sort of thing--if I can find some "best of" stuff. Scammers and spammers aside, I'm just not seeing the traffic here these days to make the crap I had to go through just to post this one. (That would be a blog post in itself!) I'm doing everything on my Facebook pages these days. Hope you'll check them out, if you haven't already. I'm seeing much more traffic there. Timely given our current polar vortex/ hypothermiageddon situation! Check the date on the newspaper! The photos could be here today, though the cars are out of date. That newspaper was published on your first birthday. All of that snow was in your honor! 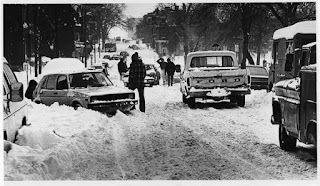 I remember the Blizzard of '78-'79 snow every day from Christmas Eve of '78 until April the next year! No place to put all that snow! We had mountains! We had an ice storm on New Year's Eve 1978. I was seven months pregnant with Collin and we had a power outage at home. Rang in the new year at Pizza Hut! Coming Attractions: Do You or Don't You?